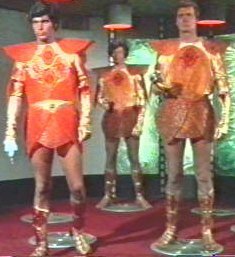 The Elasians are a fierce population of the Elas planet,one of the planets of the Tellun system, for long time in war with the TROYUS planet. They are also devoid of any sense of the diplomacy. Dilithium crystals are abundant on Elas, which has the Klingons interested in the planet. Using of the primitive knowledges of interplanetary flight, Troyius has dragged Elas in a war for the dominion of the stellar local system. The Federation has sent of the negotiators in order to set end to the conflict, that had been able to combine a wedding between the daughter of the ruling family of Elas, Elaan, with the governor of Troyius. The Elasian ship had atomic propulsion. Women of Elas have magic tears that make you fall in love with them when touched and the spell never wears off . There was no antidote to the spell the tears cast., but McCoy finally does to come up an antidote. 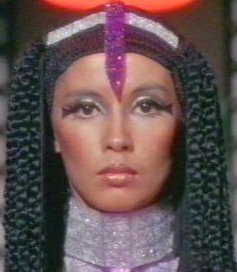 Dolman (the princess of Elas) is wearing a dilithium crystal necklace (and she changed dress six or more times in the episode...! ).